Hello Friends! 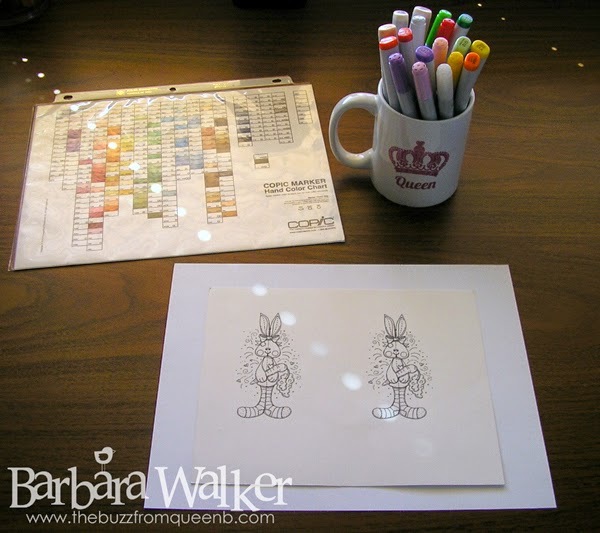 Today is the day the 30 Day Coloring Challenge begins. I hope you're joining in. I have a nice stack of images all ready to color; images that I received from swaps, images that I stamped and never got around to coloring and digi stamps that I printed and tucked away for "one day". 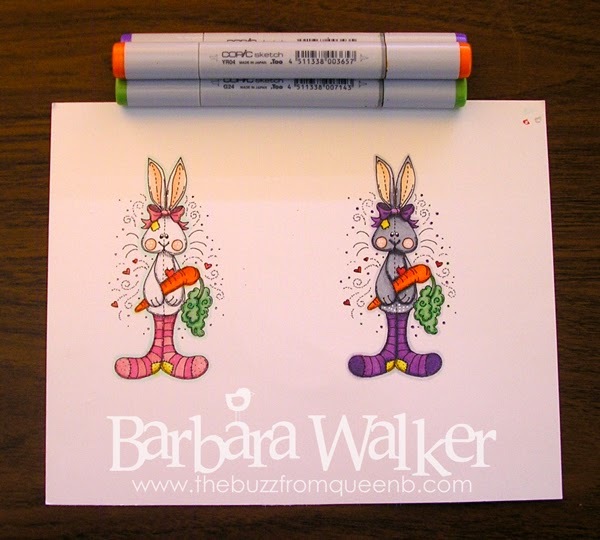 For my coloring project today, I selected Sew Country Bunny, a digi stamp from my beloved MelJen's Designs collection and I decided to color it with Copic markers. The first thing I do when I plan to use Copics, is pull out my charts. I have a few that I refer to during my color selection. I go over the charts and decide what color families I'd like to use. 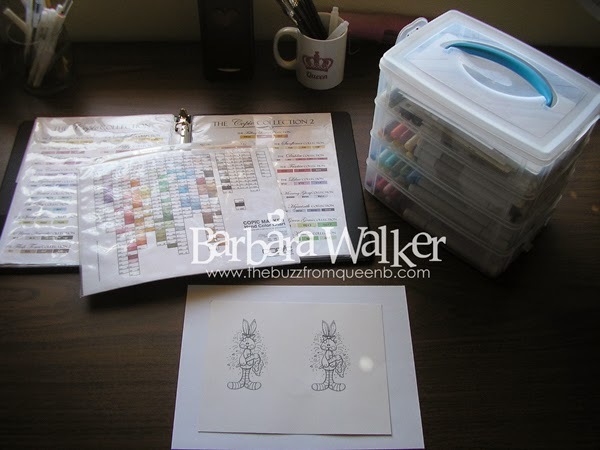 Then, I pull the colors from their various compartments and I put them into my mug or other containers if the mug is too small for the amount of markers I've chosen. And...I'm all ready to color! I love having music playing in The Hive while I create. I really enjoy piano music, harp or violin, but I especially love the saxophone. Sooo, today, I was serenaded with Christmas music by Kenny G. I really do listen to Christmas music all year round. It's my absolute favorite! I cannot express how freeing it was to just sit and color with no particular 'destination' in mind. I LOVED IT! I may create a card with these images and I may not. We'll just have to wait and see. That's the beauty of this whole challenge...NO PRESSURE. JUST COLORING FUN! I look forward to sharing with you again tomorrow. Thank you for stopping by! Cute little bunnies! 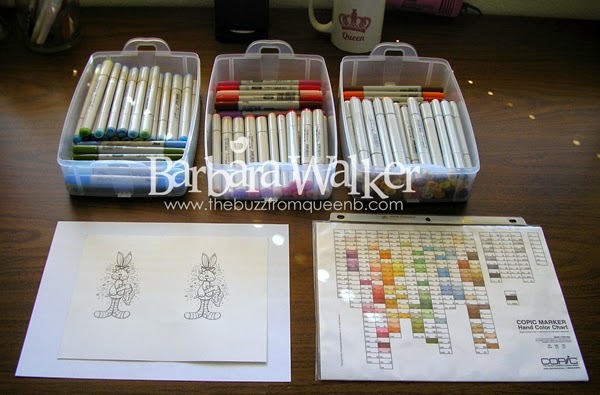 I see your Copic Chart is quite full! I too take them all out to see which may be required for the coloring. What a great idea to select Christmas Music Barb, sometimes my radio doesn't come in well so I shuld just type in a genre and listen online! Duh! Looking forward to following your challenge! Oooh, I'm so tickled to see that you will be sharing your creativity with us. Your bunnies look fabulous! I so wish I could do this with you. There may be days when I can sit down to color, but most days, it's not in the cards for me. Can I live vicariously through you and your coloring? Hugs! !